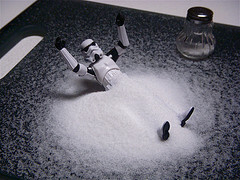 Watching someone dump a whole lot of salt on their meal might make a person cluck in disapproval — “Don’t you know that too much salt is bad for you?” And while a person’s blood pressure can go up, leading to possible ill health effects like heart attacks and strokes, a new report says that there is no good reason for people to aim for the very lowest of the low levels recommended by national guidelines. We know — it sounds like taking years of public health warnings and medical advice and throwing it out the window. But while you shouldn’t go unscrewing the lids on your salt shakers just yet, a group organized by the government to study sodium consumption says there’s no need to make drastic cuts in your salt intake, reports the New York Times. The current recommended level is between 1,500 and 2,300 milligrams per day, somewhere around a half a teaspoon. On the low end of that range, that’s the amount you need at the very least if you’re getting enough calories and nutritional content in your diet. At 2,300 mg, studies say blood pressure starts to rise, which can be a problem in people who are at risk for heart disease and other health issues. But the committee commissioned by the Institute of Medicine, in cooperation with the Centers for Disease Control and Prevention, says there’s no reason anyone has to aim for that low of 1,500 mg per day, and that there is no evidence of health benefits in doing so. The committee wasn’t asked to, and didn’t set out the optimal amount of salt we should be eating. Basically we just shouldn’t eat too much. On average, people around the world eat about 3,4000 mg per day, says the Institute of Medicine. Some of the studies examined by the committee showed consequences like increased rates of heart attacks, strokes and death in groups directed to eat lower levels of sodium, while another showed health risks increasing in both the groups that consumed fewer than 3,000 mg as well as those ingesting more than 7,000 mg per day. This new report is of course, shaking things up in the medical world on both sides of the salt shaker. On the other hand, the Center for Science in the Public Interest and the American Heart Association don’t agree with the committee’s conclusion. “It would be a shame if this report convinced people that salt doesn’t matter,” said Bonnie Liebman, director of nutrition at the CSPI. The AHA says people should still aim for 1,500 milligrams of salt for day, over concerns about the large amount of sodium in processed foods. “The American Heart Association is not changing its position,” Dr. Elliott Antman of the AHA said, adding that the association is of the mind that the Institute of Medicine’s conclusions are flawed because the studies it looked at had methodological problems. The Department of Agriculture and the Department of Health and Human Services is set to issue new recommendations for dietary guidelines in 2015, updating its 2005 guidelines. It’ll be interesting to see which side of the salt argument it shakes out on. In the meantime, maybe don’t go over-salting your already salted fries.